They will always be with us in spirit. I’m reminded over and over again, that rescue work is a tough master. Saving lives comes at a price, a price that often times is heartbreaking. Even when we do everything we can, it’s the sad reality that we can’t save them all. But we keep trying, even with broken hearts. It’s what makes us different and what makes us move forward each and every day. Our spirit cannot be broken. 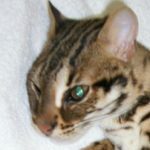 Yesterday, I met – and in an hour let go of – a beautiful F1 Bengal. He suffered at the hands of his owner and the best gift we could give him was to take his pain away. The night before last, he was dumped at an animal facility’s front gate in near freezing temperatures. The owner of the facility called TWS right away in order to help this boy. Spirit, as we named him, was emaciated and a mere 3.9 pounds. He was flea infested and dehydrated. But that didn’t deter our vets at Cedar Pet Clinic. They would have helped us do anything to nurse this magnificent boy back to health. But then the worst news came, he was Feline Leukemia positive and his body was shutting down. We knew we had to help him get to his new wild life, to be with so many others that have already moved on. It is amazing how much love and loss you can feel for an animal that touched our lives so briefly. He came to us as an unknown and left us only a few short hours later as our Spirit. We can only assume that the owner had him illegally and therefore did not seek veterinary treatment. F1 Bengals and wild cats are illegal to own in Minnesota. Not only was this a cruel thing to do to Spirit, but the owner put several other animals at risk since Feline Leukemia is a very contagious and deadly disease. We only hope that other animals will not end up suffering the same fate. All animals deserve the basics – food, shelter and veterinary care. But they also deserve so much more. They deserve love and compassion. Though he came and went so quickly, we will honor him with a Memorial Plaque here at TWS to ensure his spirit and story lives on. You can help us remember Spirit by making an in memory donation.